So I was intrigued as to whether the NCI method might find something that my analysis using the QTAIM procedure might have missed. The required program is available for download. I will not go into the theory behind the program, but like AIM, it uses the properties of the electron density via a combination of the first and second derivatives to concentrate on the non-bonded or weakly interacting regions of a molecule. The results of the analysis (using the SCF option in the program, and a B3LYP/6-31G calculation) are displayed using VMD, and I cannot pull my usual trick of displaying the surface within the page of a blog via Jmol (although it seems Jmol with some effort could probably be persuaded to also render the information). So the above cannot be rotated. I have therefore circled one (there are others) interesting region in red. This encloses two surfaces. I should explain the colour coding adopted by the program. Red would be a repulsive interaction, and blue attractive. 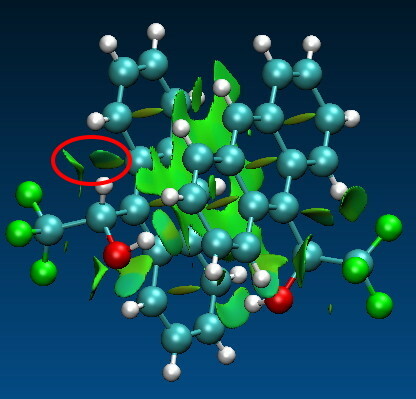 Weak interactions are shown in green. In the diagram above, these include the π-π stacking and various hydrogen bonds. 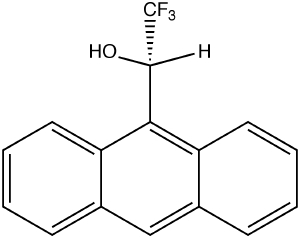 But concentrating on the two surfaces inside the red circle, one occurs between the two hydrogens shown below. It catches the eye because there is a blue-tinge to the colour coding! This might mean it is a bit stronger than just “weak”. The NCI method I do not think is meant to provide a definitive answer to the question; is that interaction real/strong? It serves, as I noted earlier, to spike interest. Here, it does that, since this particular interaction had indeed never previously been identified for attention (the obvious had been missed!). Highlighting such potential regions of a molecule and perhaps then helping in the design of experiments to test if the interactions are real is what the NCI program is meant to do (IMHO)! 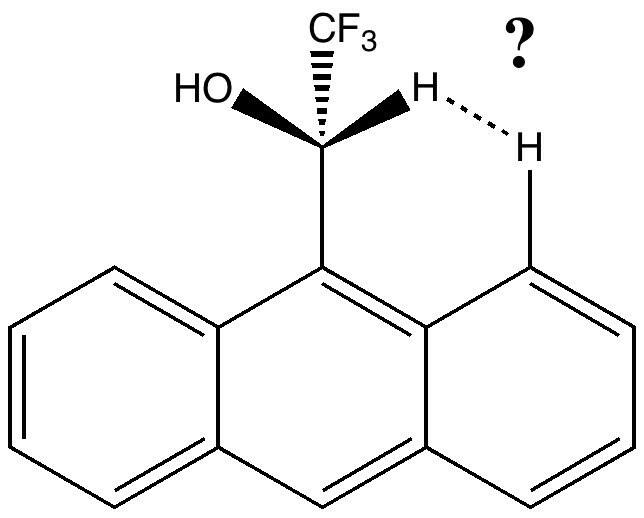 This entry was posted on Thursday, July 15th, 2010 at 8:50 am and is filed under Interesting chemistry. You can follow any responses to this entry through the RSS 2.0 feed. You can leave a response, or trackback from your own site.